"Do as I say, or we're both dead." 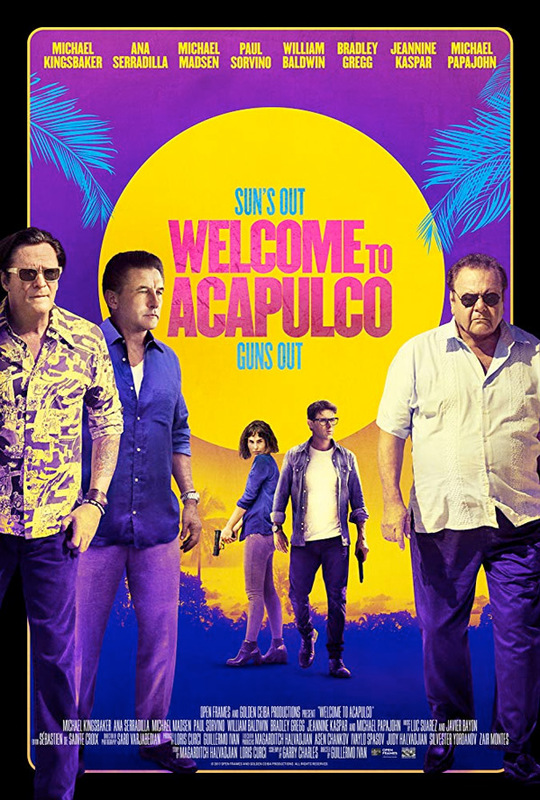 Momentum Pictures has debuted a trailer for a new action comedy titled Welcome to Acapulco, made by Cuban filmmaker Guillermo Iván (of Bolaetrapo, Blue Family, Habana Instant). The tropical crime plot involves a kid who ends up in landing Acapulco, Mexico instead of New Mexico. As soon as he lands, he finds himself on the run from high-powered criminals, deadly hitmen and the Feds, all looking for a mysterious package that he has allegedly smuggled through customs yet knows nothing about. Mike Kingsbaker stars as Matt Booth, and the cast includes Michael Madsen, William Baldwin, Bradley Gregg, Ana Serradilla, Ana Layevska, Zach Rose, Guillermo Garcia, Maria Elena Heredia, and Loris Curci. This looks ridiculous (and we've seen before anyway) but entertaining. Video game designer Matt Booth has one shot to save his career by unveiling his biggest project yet at the Video Game Awards in New Mexico. But after running into a friend at the airport and having a little too much to drink before his flight, he ends up in ACTUAL Mexico - specifically, Acapulco. As soon as he lands, he finds himself on the run from high-powered criminals, deadly hitmen and the Feds, all looking for a mysterious package that he has allegedly smuggled through customs yet knows nothing about. Partnering with a badass, beautiful femme fatale and channeling his inner video game action hero, the pair unravels a conspiracy that could shake the foundation of America, maybe even the world. Welcome to Acapulco is directed by Cuban filmmaker Guillermo Iván, of the films Carrusel, Bolaetrapo, Blue Family, Habana Instant, and The Strike previously. The screenplay is written by Garry Charles, from a story by Loris Curci and Magarditch Halvadjian. Momentum will release Welcome to Acapulco in select US theaters this spring.